How To Add or Duplicate Input Fields Dynamically Using jQuery? If you are looking to add and remove duplicate input fields, here's another jQuery example below to do the task for you. 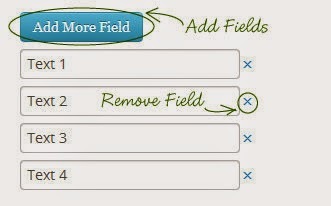 This jQuery snippet adds duplicate input fields dynamically and stops when it reaches maximum allowed fields. How to capture array values using PHP from these input fields and save it in mysql in my next post.